This project consisted of the rehabilitation and repair of 57 residential and collector streets at various locations throughout the City of Downey. 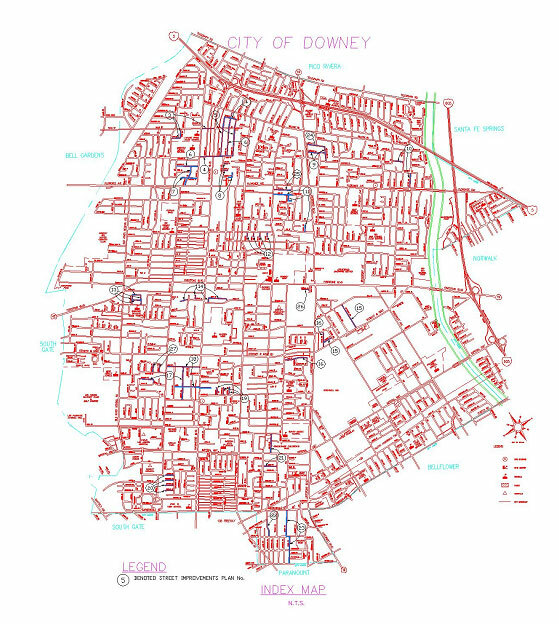 These streets serve a combination of existing single family and or multi-family residential neighborhoods and commercial/industrial uses within the City of Downey. Most of the streets are fully improved with curb and gutter and asphalt pavement. The improvements for the subject streets within the project limits included cold plane of existing pavement and overlay with Asphalt Rubber Hot Mix (ARHM), and full depth D.G.A.C. reconstruction of failed pavement sections and roadways. Pavement sections for each street were provided by the City of Downey based on our Geotechnical Engineers review and recommendations of City provided T.I. and R-value data. The repair of miscellaneous damaged sections of curb and gutter on each street were marked in the field by the inspector, with a bid item included in the specifications for unit pricing. Damaged driveways and curb ramps within the project limits were reconstructed to conform to the latest ADA requirements.